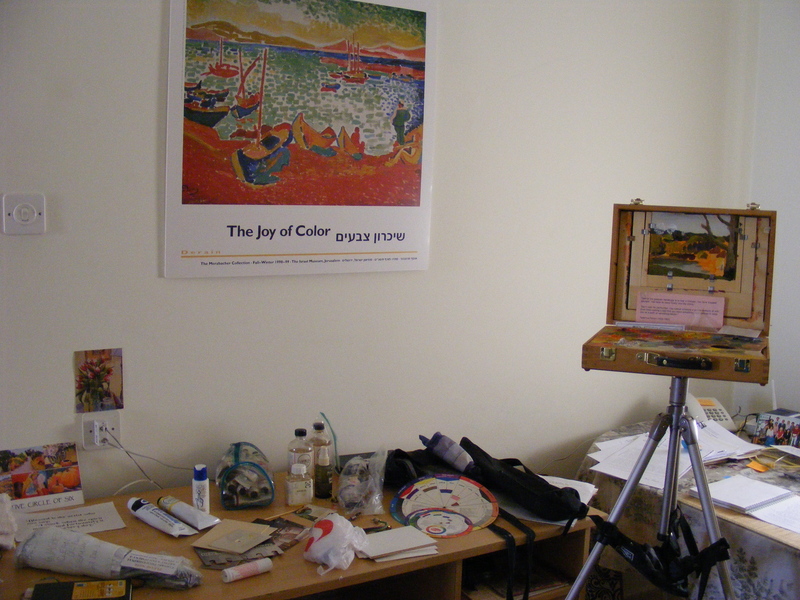 So, it’s been almost two years since I’ve had my oil paints with me, and now that they are here in Israel along with my pochade box easel, I am over the moon. Have just finished painting day no. 2 and got done just in time before the light really left the buildings outside my balcony windows. Today started out very rainy, but by noon or 1pm it was clearing. 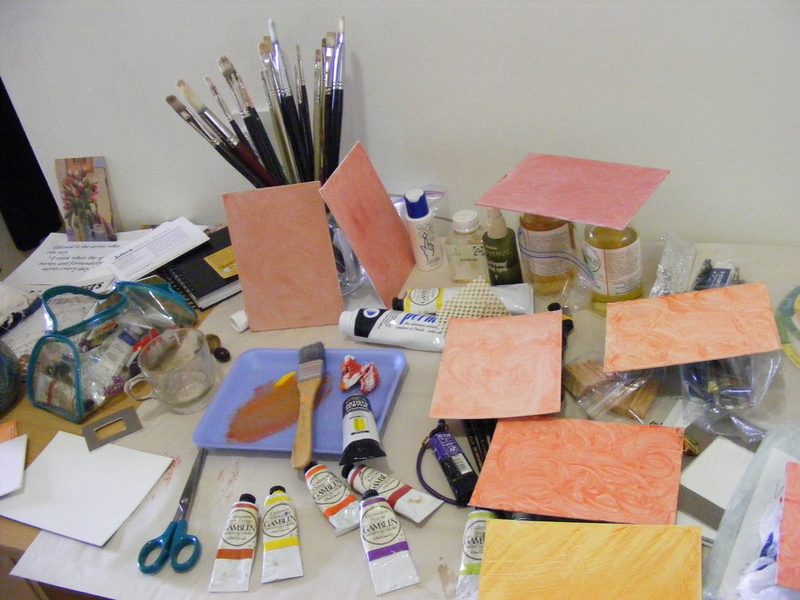 So started out by toning several of my small [5″x7″] canvases. Some are canvas covered boards and some are just gessoed mat board. Doing several at a time gives me the ability to just grab and go next weekend before the sun fades! Glad I remembered to take a few pictures of the canvas before it was completely covered. In this photo you can still see some of the outline work. Also realized today that I should NOT paint in the dining room! The light goes dim too soon. 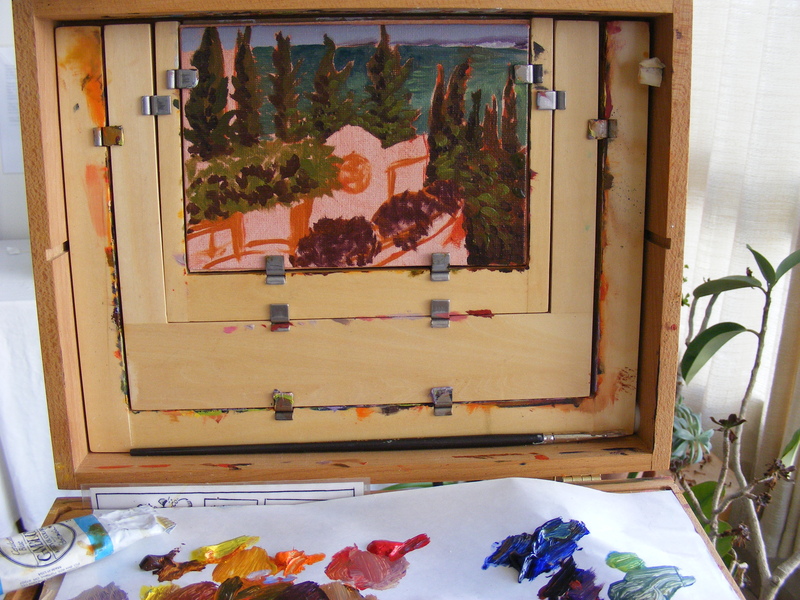 So here’s a picture of the painting on the easel on my balcony. The balcony was the perfect place to set up painting as it’s glassed in on three sides, and by afternoon there is no direct sunshine. You can see that the entire painting is covered, but am not sure that it’s a finished painting. It’s more of a sketch. Here is a close-up showing brushwork of the ocean and the shore over by ‘Akká. 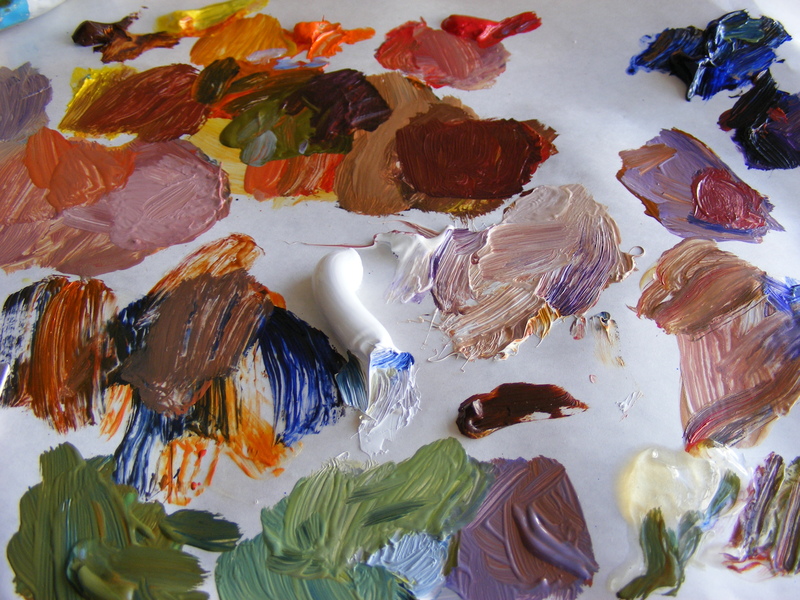 Close-up of my palette and paint mixtures. Okay! I feel like I earned my coffee and cookie this afternoon!!! 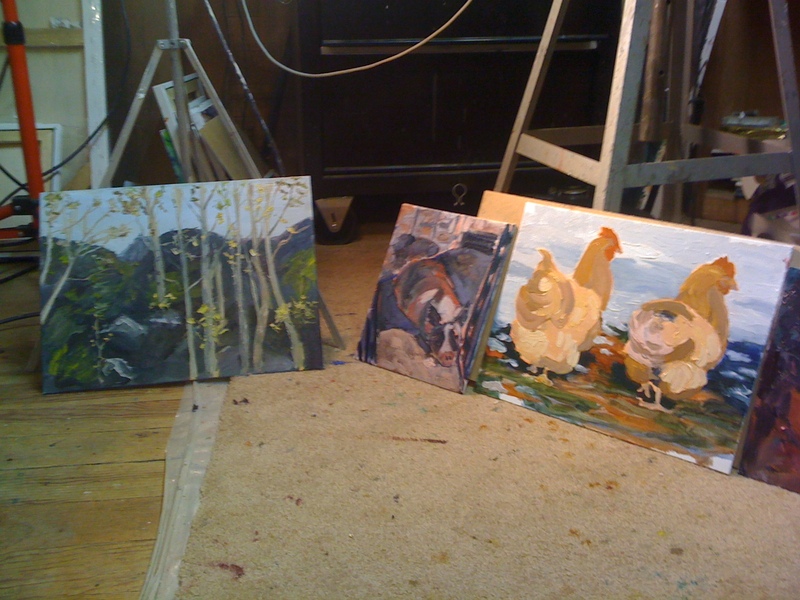 It’s been almost two years since I packed up all my oil paints, brushes, etc. and stored everything in a storage locker in the mountains of northern California. Did think to save out my plein air painting kit – stuffed into an old backpack that my son Jon used in 9th grade. Left the backpack with my father, and a kind friend brought it to me here in Israel last week. WHAT excitement!!! The smell of oil paint as I reached in to bring out the cigar box sized pochade painting box, and my fingers meeting up with sticky wet paint! Only one casualty of ultramarine blue squished between a suitcase rib and the bottom of the wooden box…. Small price to pay for the entire bag full of paints, linseed oils, brushes, palette, old apron, bungee cords, and other painting-in-the-wilds accoutrement! After unpacking most of the suitcase full of oil paint materials. This first photo shows most of the stuff spread out on my desk. 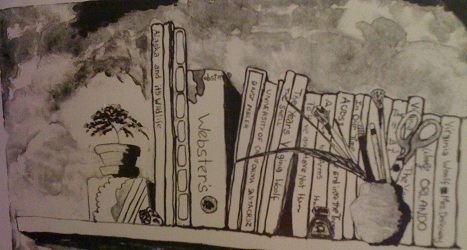 Sketch book for planning composition, huge bundle of brushes which were cleaned and packed on 27 Dec. 2010. 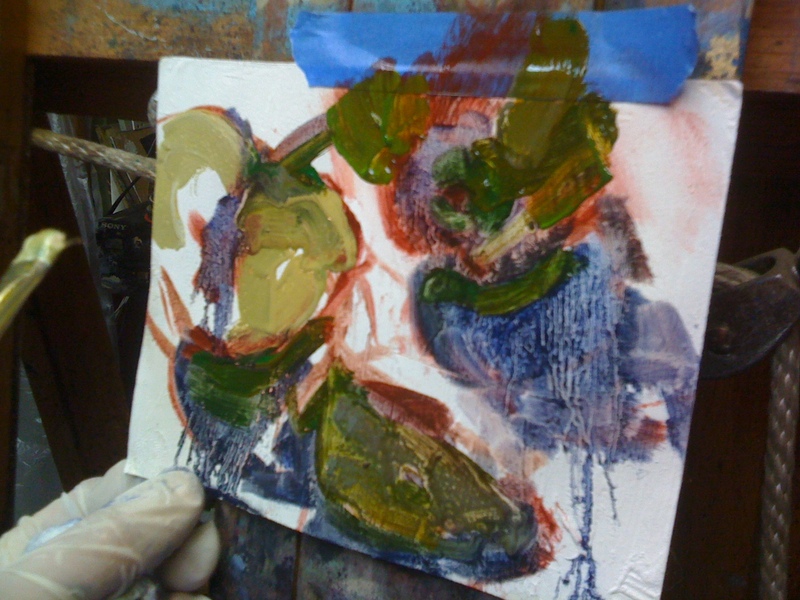 Extra white and cadmium yellow [the large tubes], tube of Kiss-Off [a great quickie paint remover! ], small painting panels, various view finders, mini bungee cords, clear bag filled with 37 ml. size oil paints [mostly Gamblin], my apron from Daniel Smith, colour wheels, pouch for tripod, linseed and stand oils at the back. The pochade box is on the right edge of pic. 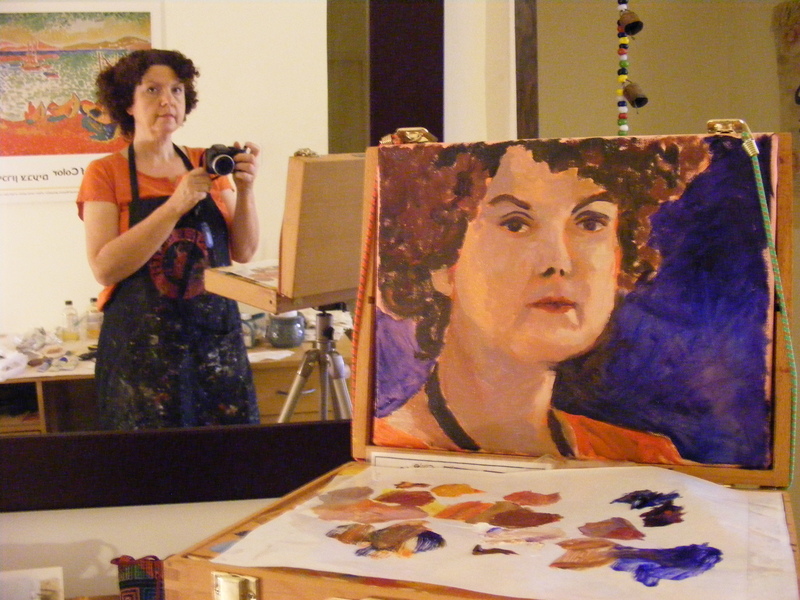 First oil painting done in Israel – self-portrait – 3 Nov. 2012. Was trying to look into the mirror exactly as I did to do the portrait. However, the light had changed dramatically. The light coming from the left is from a lamp in the dining room, and is much brighter than the actual light that I painted by. 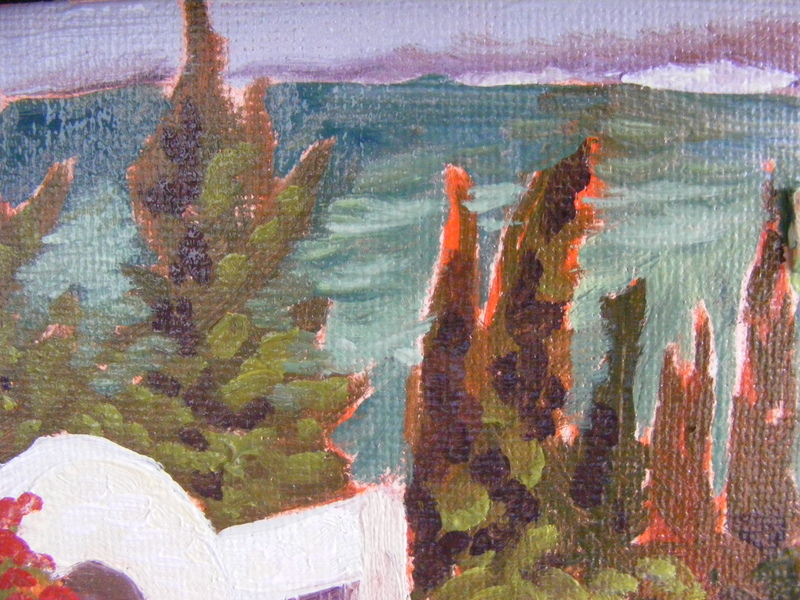 Close-up of first oil done in Israel. 3 Nov. 2012. After painting fast to get the light right, noticed that my facial proportions are only just barely there because of habit of doing self-portaits demonstrations for all my workshops and classes! At this point had to stop because even after doing a wipe-out there was still too much paint on the board to do detail work – eyes etc. Bad glare on the photo as the sun had gone down as well……. 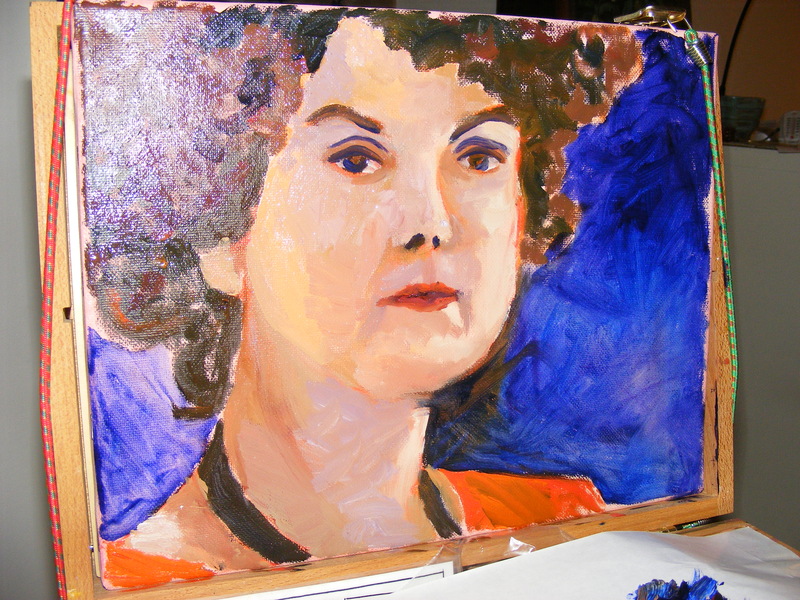 However, doing a self-portrait is a great way to try out new paints, or try out a new technique. All it takes is a mirror; the model is free! 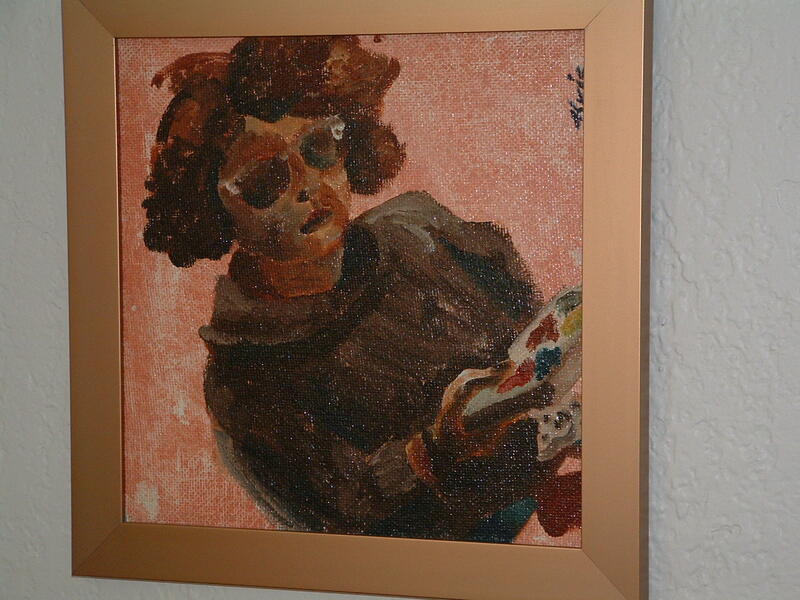 Above is the first self-portrait I attempted in oils. Done while at University of Calif. at Santa Cruz, 1993, this was done on the deck outside my student apartment, painted on the back of a piece of masonite board while observing myself reflected in a sliding glass door! 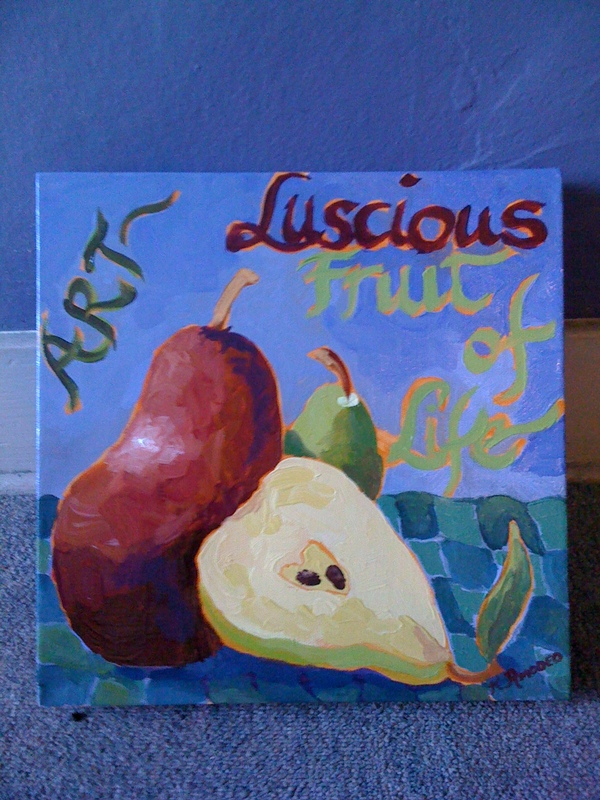 Lack of ability to worry about much detail created a great impressionistic touch. 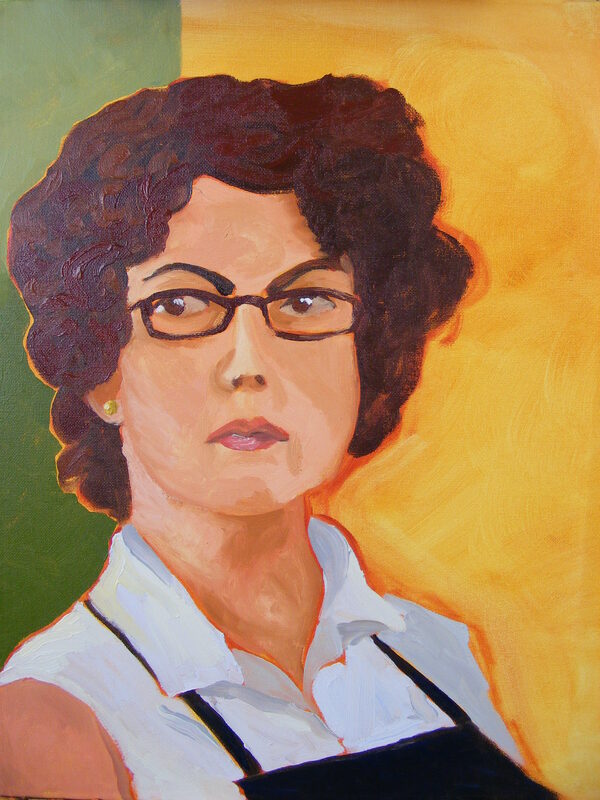 Self-portrait done early 2007 – Sonora, California. 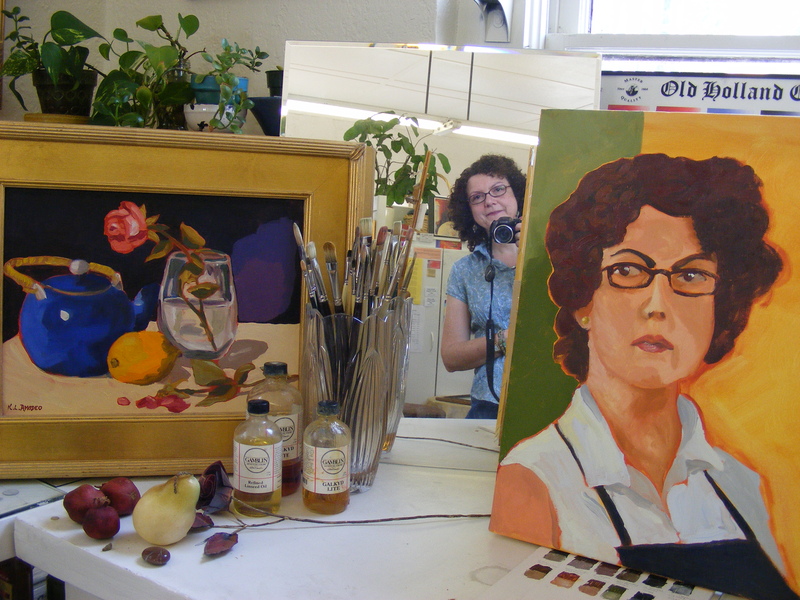 This self-portrait in oils was done in my Sonora Studio in June 2007, and was the first one attempted with glasses! I’ve worn glasses since I was 14 years old, but had never put them into a self-portrait! This one was done with more precision and hard edges. 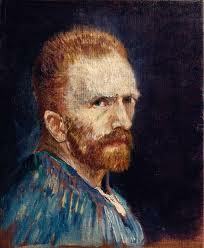 Self-portrait by Vincent Van Gogh. These two photos show how one can have fun and experiment with colours and brush techniques by doing different sittings with yourself as the model. In the top portrait Van Gogh has used a more traditional style with dark background allowing the realistic pale complexion and red hair to stand out. 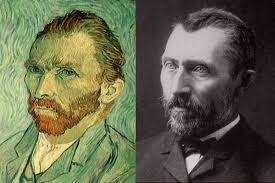 Side-by-side self-portrait and photograph of Van Gogh. In this portrait Van Gogh has replicated his face but also played with amping up the colour and swirly brushwork throughout the background emulating the movement of hair and beard. Sorry that these images are so small. One of my favourite books is one of the “Faces of Van Gogh”, a wonderful compilation of Van Gogh’s many self-portraits made throughout his life. 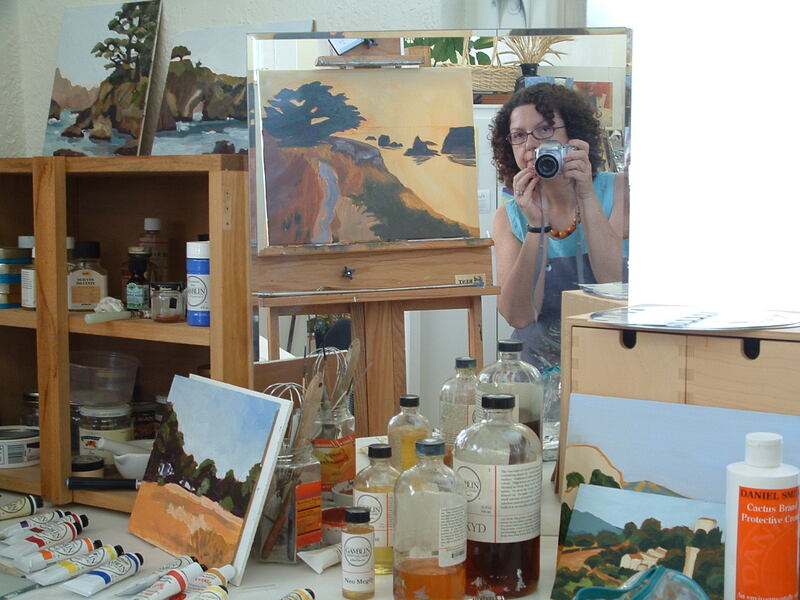 In the Studio – Still Life, Self-Portrait & Artist, Sonora, Calif. Sept. 2008. A photo montage of still life painting, still life on table, self-portrait, and artist in the mirror. Bookcase in my old studio – portraits, landscapes, reference photos, quotations – general material for inspiration! 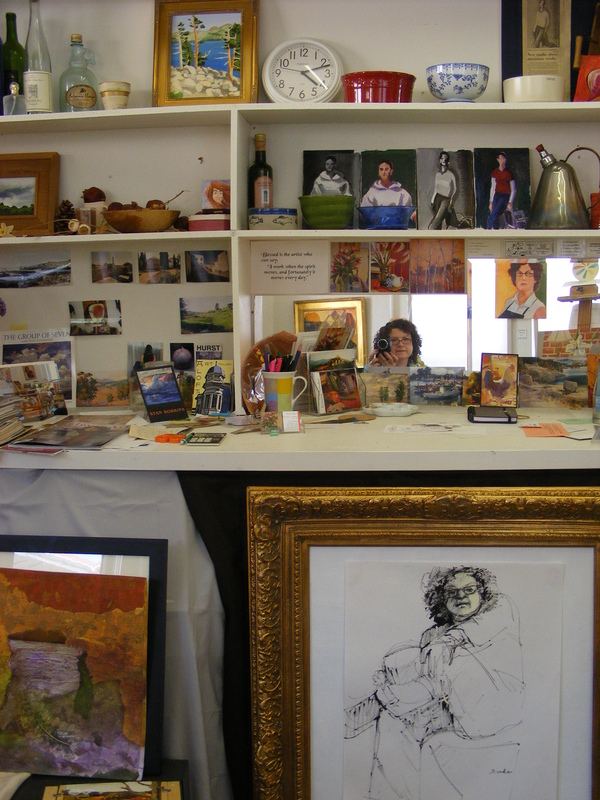 Just for fun – here’s a picture taken of part of the bookcase-storage unit in my old studio, showing four small portraits in a row painted of my daughter, the newspaper article about it in the upper right shelf; a small square portrait done on wood using all cosmetics as paints; a landscape of Silver Lake in the High Sierras at the upper left; various art show invitation cards; reflections of other paintings in the mirror; and a portrait in black ink done of me by my studio partner Sherie Drake, in the foreground. Hope this has been inspirational!! Happy painting! 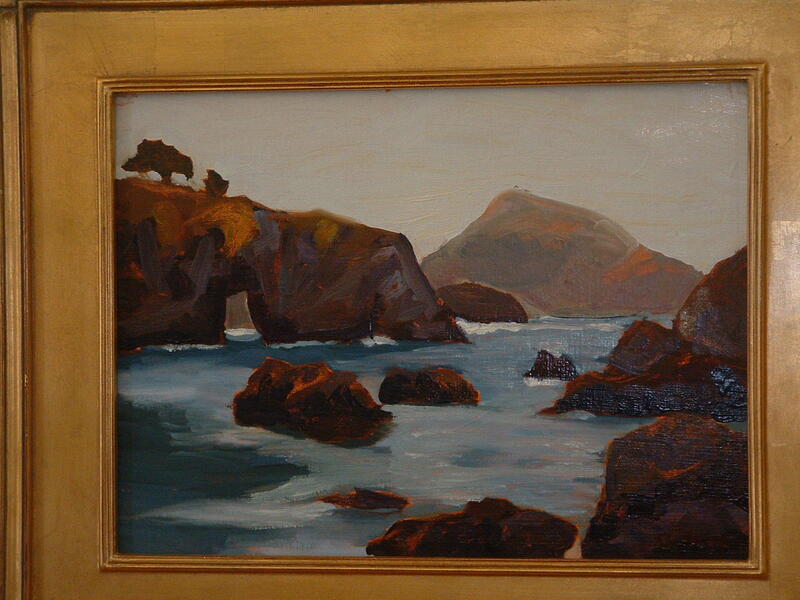 This is another blog entry showing some more artwork from my studio period in California. 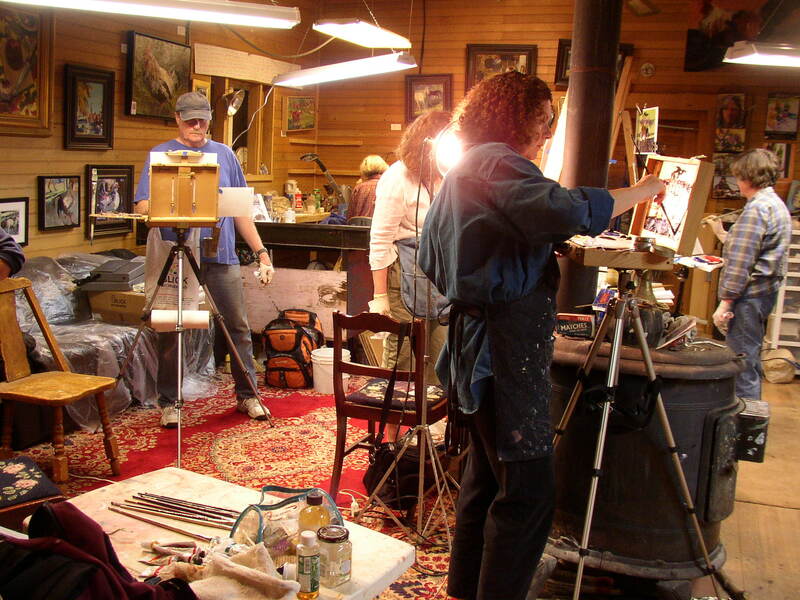 The studio here was in an historical brick building in downtown Sonora, built in 1903. We were on the second floor with 12 foot high ceilings and huge 7 ft. windows on three sides. It was a gorgeous space with 1920’s era wood floors, natural light to paint by, and plenty of space for gallery displays. 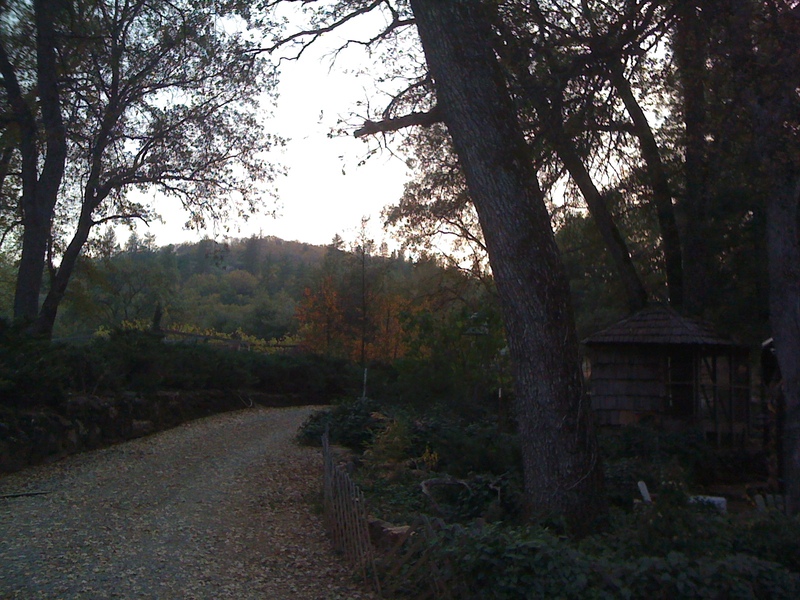 Landscape of Redhills Road area of Tuolumne County. 8 x 10, acrylic. 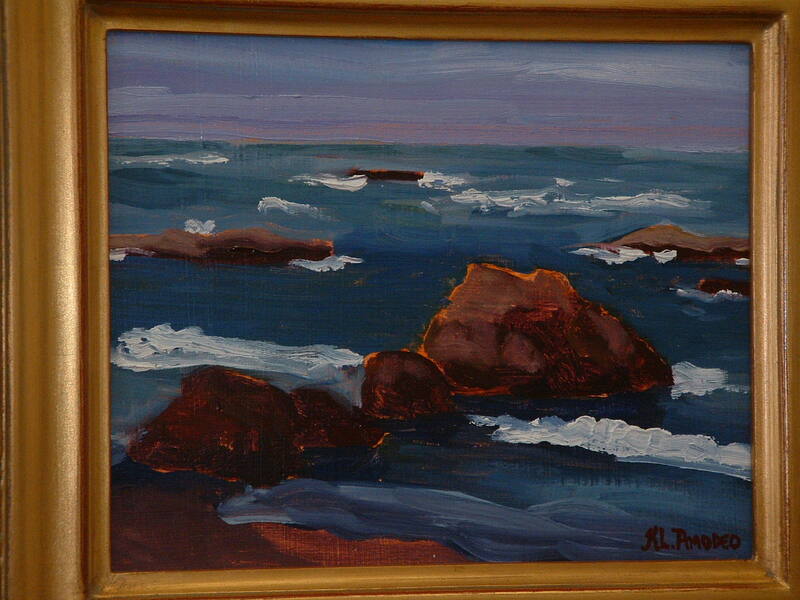 Painted down on the beach in the cove, in the fog – Mendocino Coast, Northern Calif. 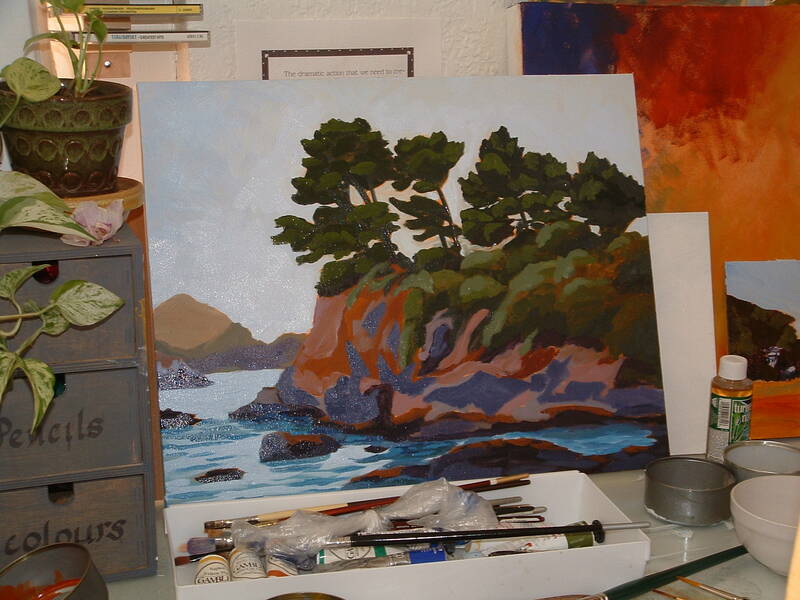 Working on a larger canvas of Mendocino pieces back in my studio. This was of the same cove, but focusing on the one cliff across from the beach. Another large canvas being worked on back in my studio after the trip to Mendocino. This one is a more foggy view of one of the headlands with the Mendocino pine tree out at the tip. Coastline north of Fort Bragg, California. 8 x 10. Oil on panel. 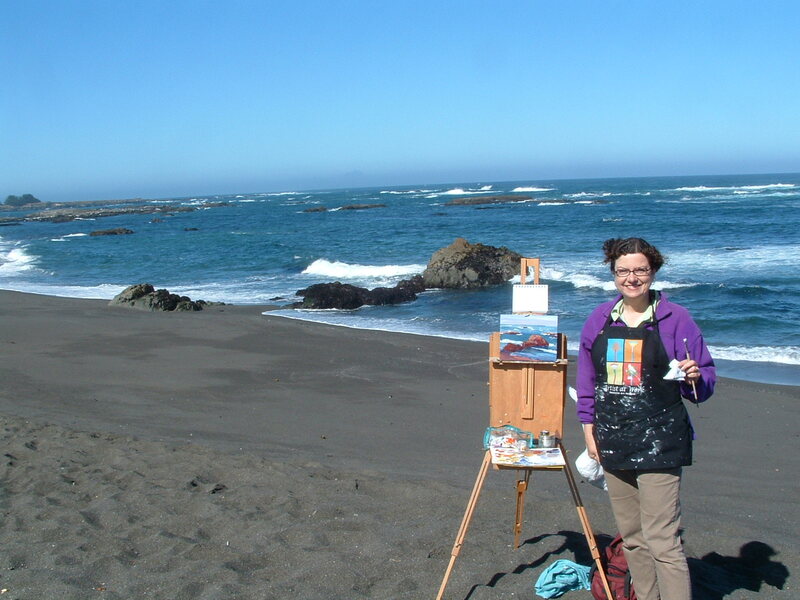 Pic of me plein air painting on the beach north of Ft. Bragg, Calif. It was windy! And the sand was blowing too. 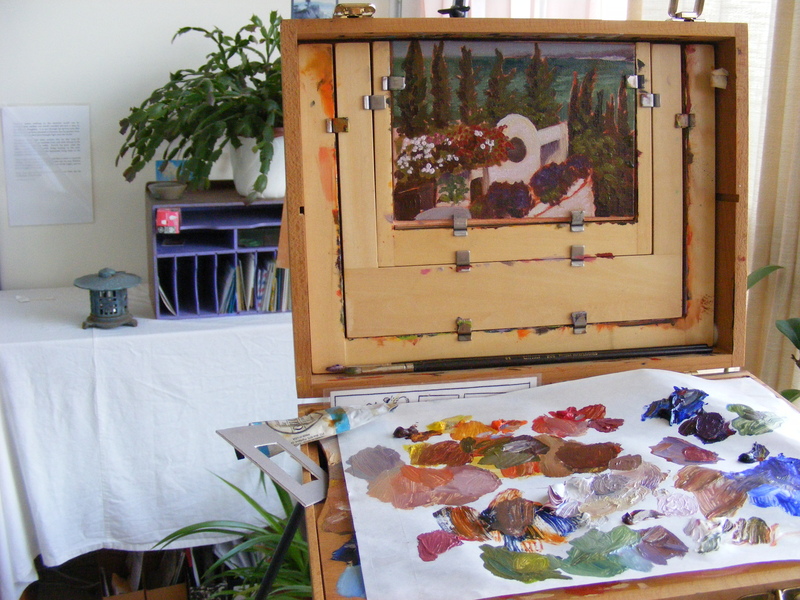 That is the previous painting [posted above] on the easel. This was one of the brief mornings with sunshine. Most of the week had been totally foggy, but it was gorgeous. 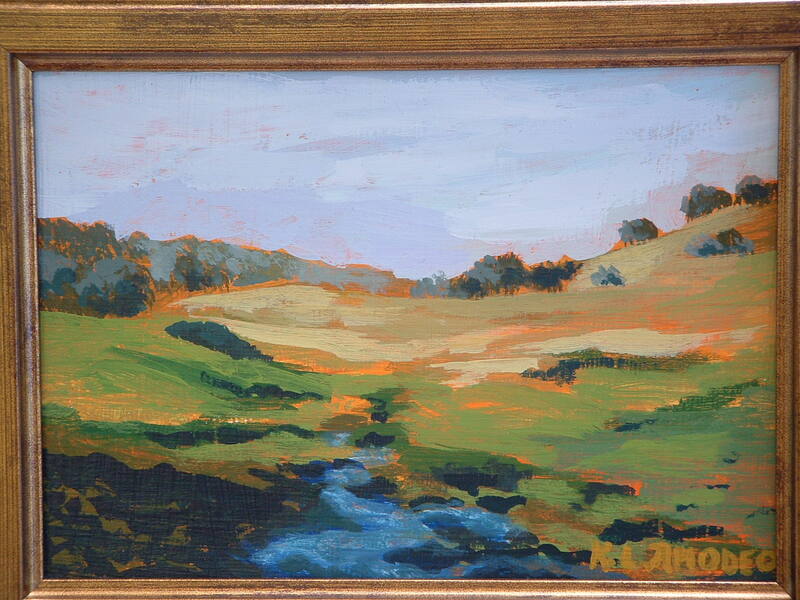 Painted this panel in 45 minutes, as we were packing the car to drive the five hours back to the mountains of Sonora. This photo was taken during my previous life where I painted every single day, sometimes numerous paintings; sketched, framed, hung paintings, taught classes, lectured, juried, curated and demonstrated. So in September 2009 decided to become the student again! 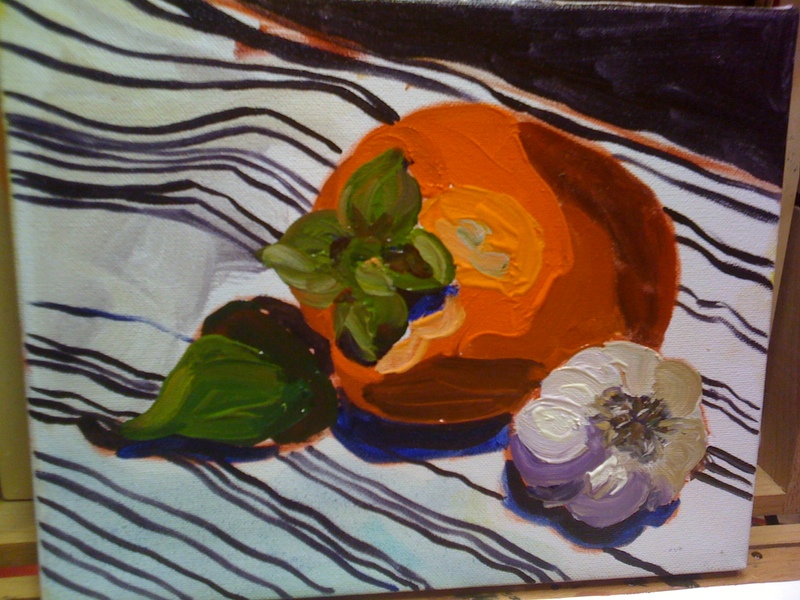 This still life above was done during a workshop with a good friend in her studio in Northern California. 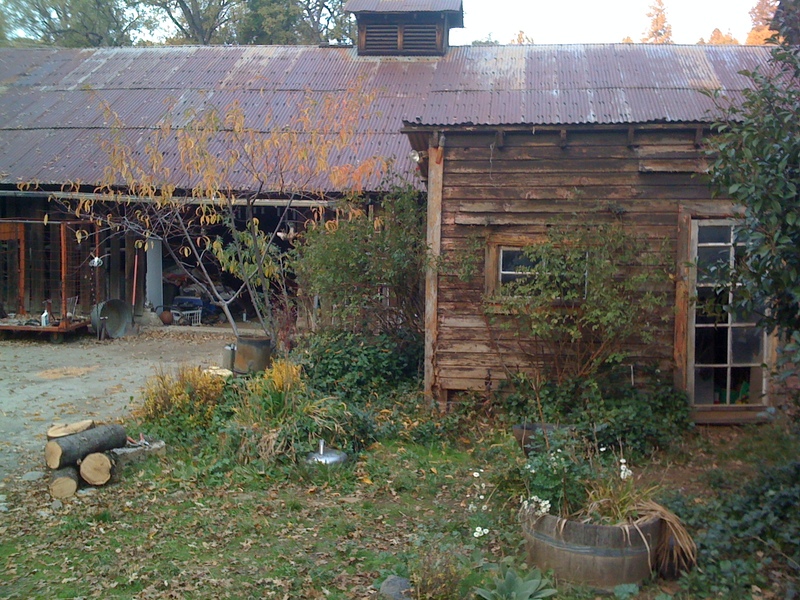 We were inside an apple barn converted to a house and studio; completely paneled in wood, hung with fresh paintings, carpeted with old rugs, kept warm by a pot-bellied stove. 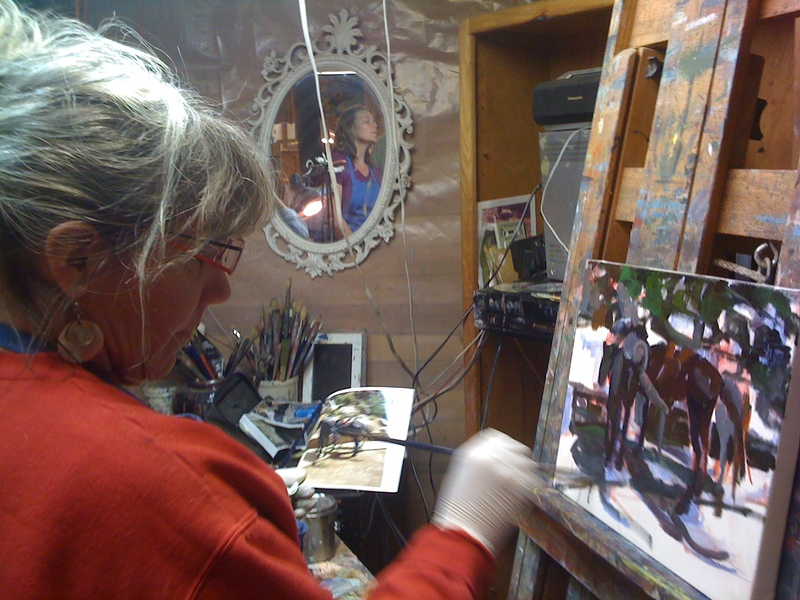 In the top photo we were painting horses…… It shows my Guerrilla Painters cigar box pochade box on a tripod – my favourite painting set up for plein air, or visiting someone’s studio, because the height is adjustable for tall people!! 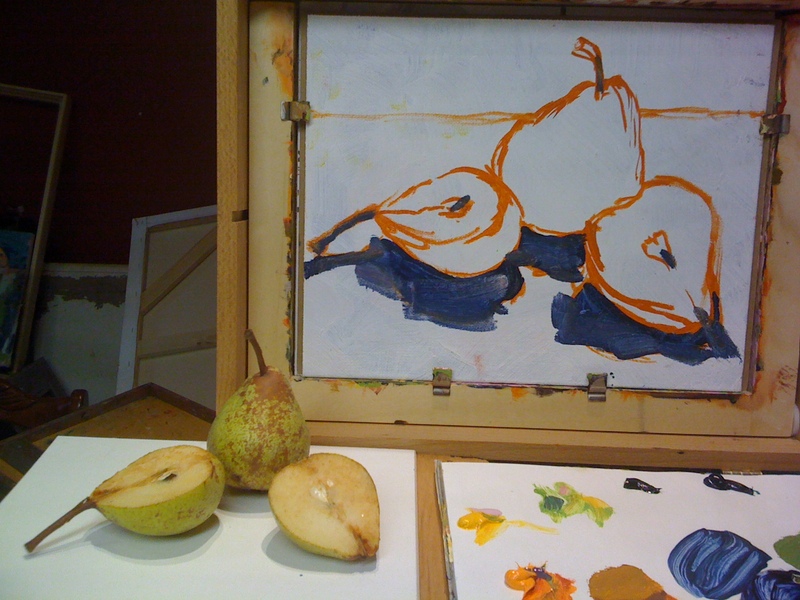 The pear study was begun in order to test out using a painting medium made of a high proportion of stand oil. It created VERY juicy looking paint which took about three months to dry completely, but which still retains its “wet look” after two years. Love this series. The cowboy and horse study turned out okay for a first one….and that type sells well in the ranching/gold rush town/area where my gallery was located. 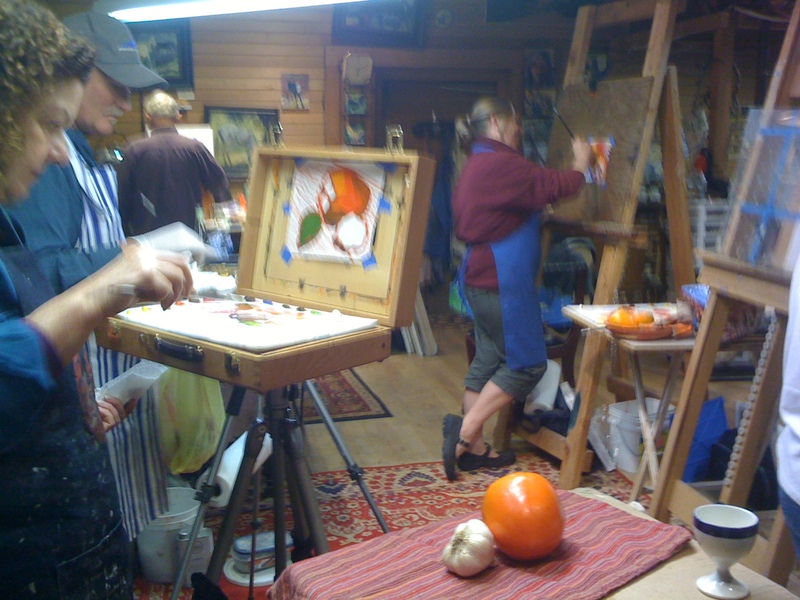 This week we worked on still life of our own choice – persimmon and garlic were the stars of the canvas. Persimmon & Garlic #2, before completion of the cloth. Having a ranch full of animals – horses, llamas, pigs, goats, chickens, roosters, etc., one of Diana’s specialties is naturally – animals! We were practicing chickens, roosters and cows! 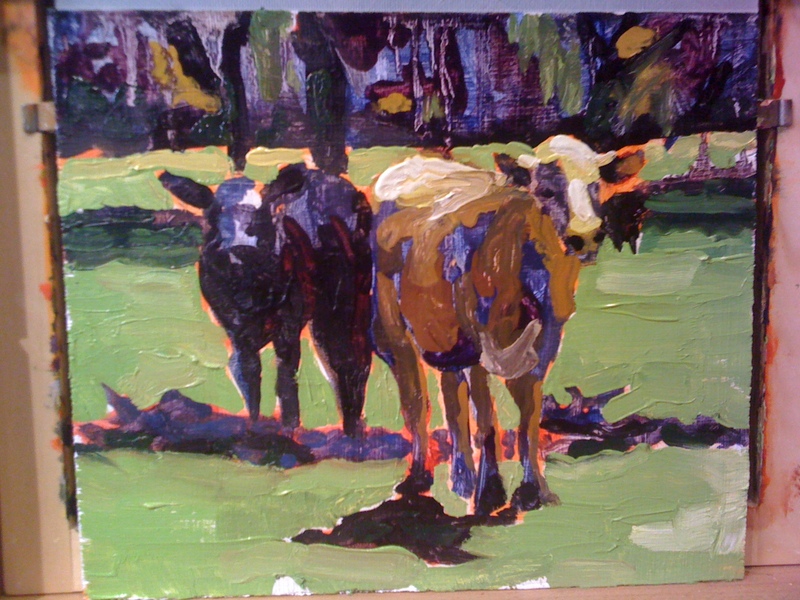 Cows painted on 8″ x 10″ piece of gessoed watercolour paper. 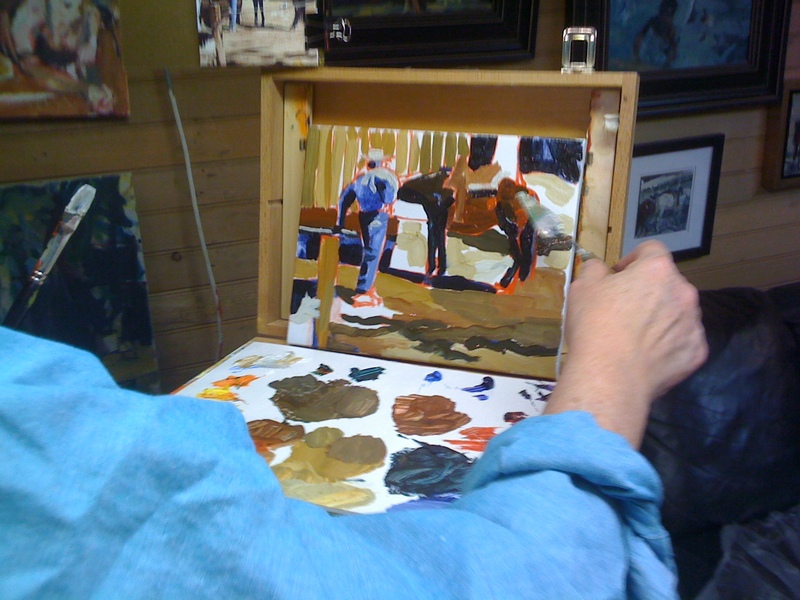 The background near top of painting is left open as Diana demonstrated, in her loose drippy style! 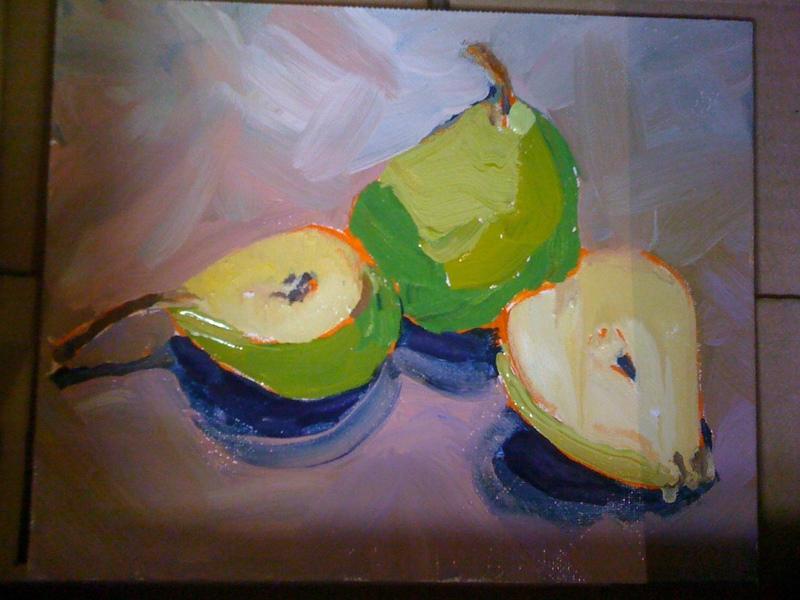 Diana’s Apple Barn, Tuolumne, Calif.
A photo taken outside the apple barn…..great subject itself for painting, but the sun was going down fast…..
On Diana’s Ranch, Tuolumne, Calif.
Diana’s drippy pears in the middle of her demonstration. They started out as drips and gradually emerged as pears! Fascinating to watch! 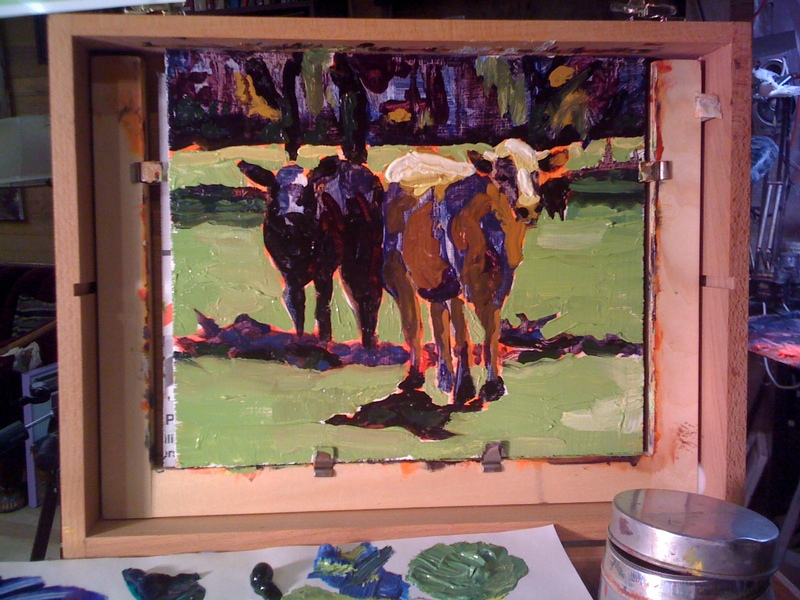 Below is a shot of the Cute Cows still on the easel…not quite finished as the stage in above larger photo. This was a major turning point to be able to grasp the solidity of larger animals in my painting. I have more practice with fruits, vegetables and tea pots!! Was sorry when this workshop ended – but learned so much from being a part of it!!! Thanks Diana!